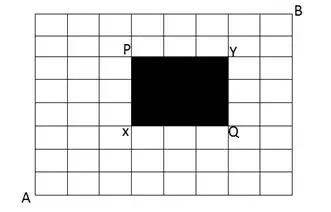 Problems based on grids/chessboards are frequently asked among various exams. They appear to be really difficult when encountered for the first time but once we get hands on, they become really simple. The key lies in understanding the basic concepts involved. Although direct questions are rare, there could be questions which test the same concept in a hidden manner. In a simple 2*2 figure, it is easy to see that there are 5 squares in total – 4 small ones and 1 large. You can see that there are 14 squares in total. Let us take an example of 2 rows and 3 columns. The number of unit squares is simply = 2 x 3 = 6. There are squares of dimension 2*2 which are 2 in number. This gives a total of 8 squares. Consider 2 sets of parallel lines (consisting of m+1 and n+1 lines) perpendicular to each other and intersect at all the points. 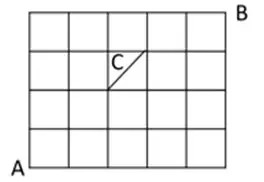 For a rectangle, 2 horizontal and 2 vertical lines are needed. 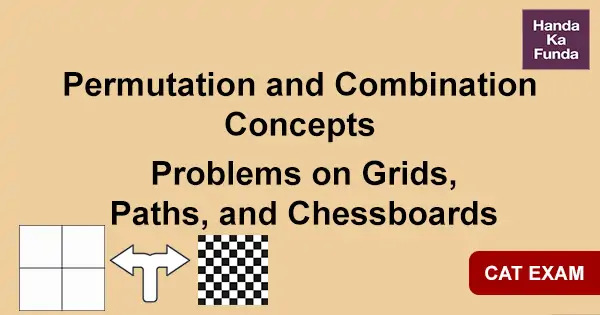 The simple grids can be solved using the permutations, whereas some of them might be confusing. A person has to move from point A to point B taking the shortest route, the number of which is to be calculated. The shortest route signifies the person has to move top and right, which implies moving left or down is not allowed. Total nine steps are needed including 5 right and 4 up, so we need to rearrange the letters RRRRRUUUU in all possible ways, which is 9!/5!4! There is a path C which shortens the route. It should necessarily be a part of the shortest route. So, we need to reach C and go at the other end and proceed to B. Now we have to reach A to D, D to E and E to B. 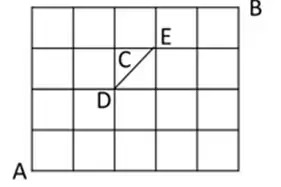 A to D is normal 2*2 grid, D to E is a single one and E to B is 2*1 grid. 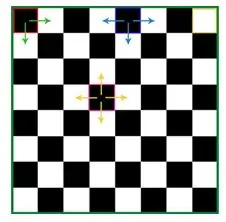 Given is a road map of a city in form of chess board (as shown in figure B where a portion in between is darkened to depict that in between roads are under construction). Find the number of different paths that a person can take to reach from A to X first then from Y to B under the condition that a person cannot take in between roads which are under construction? Now, in between roads are under construction so he cannot take in between roads which are under construction. and 2 verticals (VV where V denotes vertical step) i.e. he moved in manner VVHH. Thus, the total number of ways in going from A to B = 20 × 2 × 6 = 240. Two squares are chosen at random from small squares drawn on a chess board. Find the number of ways in which 2 squares can be chosen such that they have exactly one corner in common? Two squares selected can have a corner common if they are selected from two consecutive rows or columns. The number of ways to select two consecutive rows (or columns) are 7. Find the number of ways in which a white and a black square on a chess board be chosen so that two squares do not belong to same row or column? In a standard chess board, we have 32 white squares and 32 black squares. Thus, a white square can be chosen in 32 ways and once a particular white square is chosen, we cannot pick any other square from that particular row or column (i.e. in that row or column we will have 4 black and 4 white squares). This leaves us with 32 – 8 = 24 squares. So, the number of ways in which a white and a black square on a chess board be chosen so that two squares do not belong to same row or column are 32 ×24 =768. 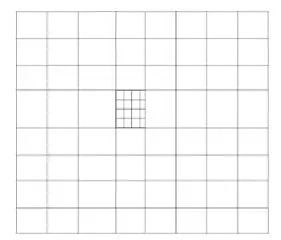 In the given Grid (A Chessboard designed in such a way that middle square of outer chess board of 8×8 contains 1 smaller grid of dimension 4×4), Find the number of squares of all possible dimensions? Since one square is common, required number of squares =204+30 -1 =233. In how many ways can you place 2 rooks on 8*8 chessboard such that they are not in attacking positions? Therefore, total number of ways= 64*7*7/2= 32*49=1568. There are 32 ways by which a white square can be chosen. If two squares are chosen on a 8*8 chessboard, what is the probability that they have one side in common? To get the favourable cases, we will consider 3 cases. Case 1: The corner squares. There are 4 corner squares. For each corner square, we can select the other square in 2 ways. Case 2: The squares on the edges. There are 24 squares on the edges. For each such square, we can select the other square in 3 ways. Case 3: The inner squares. There are 36 inner squares. 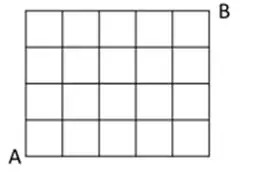 For each such square, we can select the other square in 4 ways. However, one catch over here is we have counted every case twice. If two squares are chosen on a 8*8 chessboard, what is the probability that they have one vertex in common? There are 4 corner squares. For each corner square, we can select the other square in 1 way. There are 24 squares on the edges. For each such square, we can select the other square in 2 ways. One catch over here is we have counted every case twice.